GBPUSD is under the influence of Consumer Price index for April and the UK 10-year government bonds yield. The US is also publishing Oil related reports therefore the market would be more volatile. The pair started its movement with bullish bias yesterday but after touching 1.45222 it turned into a bearish pattern. It has already created a double top and might create its double bottom as well. 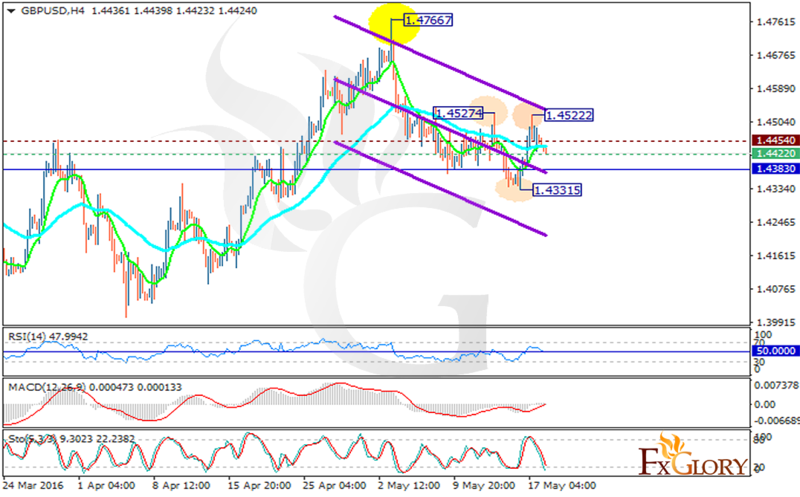 The support rests at 1.44220 with resistance at 1.44540 which both lines are above the weekly pivot point at 1.43830. The EMA of 10 is staying at the same spot as the EMA of 50. The MACD indicator and the RSI are in neutral zone without any clear signal for traders but the Stochastic is suggesting downward trend. The support level breakthrough will be a good sign for sellers because the price may go lower touching 1.4089 otherwise, the resistance breakout can pave the way for a new high almost close to 1.47667 area.